When buying or remodeling a house, your mind may be on open kitchens or plank flooring – not so much the gutters. However, your house’s guttering system is incredibly fundamental to the integrity of the structure – which is the most important part of home ownership to be concerned about. Do you know if your house has seamless gutters and when they were installed? Here’s everything you need to know about seamless gutters. The term is fairly self-explanatory: seamless gutters, unlike their predecessors, are built in single-piece construction without seams and joints. You’ll only find any sections pieced together in areas where the material must go around corners. Seamless gutters are constructed on-site, to achieve a true fit from the single-piece aluminum. There are several reasons why you might want to consider choosing seamless gutters for your home in the Quad Cities. Are Seamless Gutters Really Better Than Sectional Gutters? In times gone by, gutters could be purchased in pieces and anyone could string them up around the roof. The mass-produced sections would be connected to each other with sealants and were pretty cost-effective. However, as time went on, homeowners began to discover that these systems were prone to leaking, blockages, and even causing rust, mold and water damage to the structures. 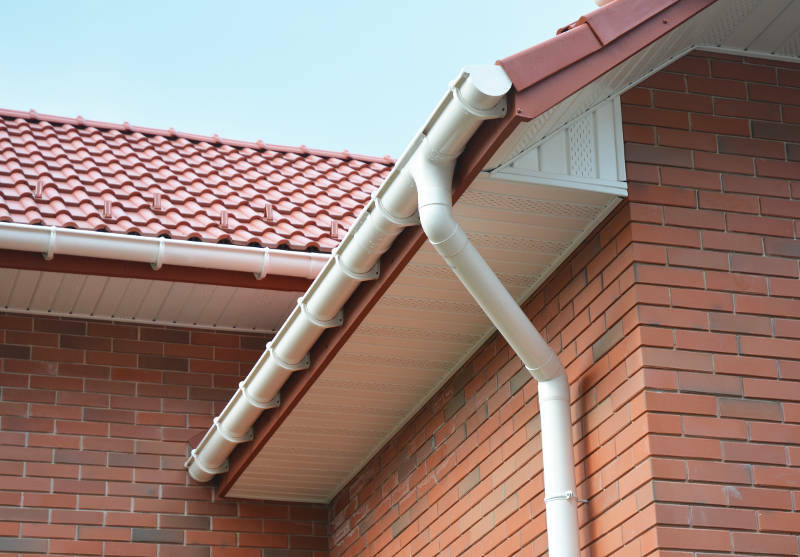 The development of a seamless guttering system was a big leap forward in reducing these problems and creating a hassle-free solution to diverting runoff. With standard sectional gutters, many homeowners had to forego family time or a fun Saturday outing and instead spend that time on a ladder, cleaning and scraping gutters. Sectional gutters have small ridges from the seams, which can allow dirt and leaves to form blockages which gradually get worse over time. This means that they demand frequent inspections, to ensure that water isn’t pouring onto the house over a gutter obstruction. While the odd bird’s nest or clump of leaves may occasionally have to be plucked out of your seamless gutters, they don’t require babysitting. Avoiding water damage from leaking and pooling is one of the main reasons seamless gutters are so popular today. Fewer seams means fewer places for water to escape. With the entire gutter system intact, all rainwater is diverted away from the house, ensuring that pools of water don’t shift your foundation or even flood your basement. With sectional gutters, even the most secure seals can and will be worn away after time and friction. Your guttering system should appear as a well-designed part of your house, blending in perfectly with the aesthetic of the structure. Sectional gutter systems often look like an afterthought, tacked onto the outside of the house. Additionally, they can be hard to color match, and an improperly sealed connection can sag or shake. Since seamless gutters are put together on site, your technician can achieve a perfect fit that blends in invisibly with your home. How Can You Tell if Your Gutters Need an Upgrade? There are a few signs you should look for to determine if you should swap out your sectional gutters for seamless ones. If you have a cracked or leaking foundation, that’s of course an obvious sign that something is wrong. Leaking and pooling from insufficient gutters can be a potential culprit. To discover the more insidious symptoms of leaky gutters, inspect all around the exterior of your house. If you find mold, rot or peeled and damaged paint, these are clues that you have water leak damage. Finally, if any of the gutter connections seem to be sagging, rotted, dented or even pulling away from the house, you’ll know it’s time for them to go. What Are Seamless Gutters Made From? You have several options as to the material of your seamless gutters. Aluminum is the most commonly used material – it’s durable, easy to work with and can withstand weather. Steel is similar in price to aluminum and is rust-resistant, but a lot of contractors don’t work with it. Copper is a super popular material, especially in historic neighborhoods, and will not rust or dent. Vinyl is common due to being the cheapest option, but it’s not quite as durable as its metal counterparts. Do Seamless Gutters Eliminate Ice Buildup? Ice buildup in gutters can be a really frustrating problem, especially for those who live in areas with harsh winters. When the pieces are clogged up with ice, they can contract and expand and possibly crack. The subsequent thaw can also lead to icy patches on the ground and roof damage. However, the gutters themselves are not to blame, and one type of gutter isn’t less likely than another to suffer ice-related damage. In most cases, this problem is related to insufficient attic insulation. When the heat is allowed to escape via the roof, the snow and ice on top of the house melt into the gutter and refreeze. This can eventually lead to large and destructive ice blockages in the gutters. Although already-damaged gutters do need to be replaced, fixing an insufficiently-insulated attic should help reduce future struggles with this issue. Can I Install Seamless Gutters Myself? If you’ve previously enjoyed doing some DIY or remodeling, it’s tempting to want to save money by upgrading your gutters on your own. However, while sectional gutters can be purchased and installed by anyone with a little know-how, seamless gutter installation requires the expertise of a professional gutter company. What’s the Seamless Gutter Installation Process? In most cases, your gutter company will be able to complete the installation of your new seamless gutters in one day. You will be able to discuss color and material so you get exactly what you want, and the technicians will measure, cut and install the gutters right there at your home. You should be able to approve the work and see that all the trash has been removed. Once the job is complete, they’ll haul off and dispose of the old gutter pieces. Seamless gutters may not be a magic button that guarantees you’ll never have any problems with ice or debris, but they certainly make your job as a homeowner a little bit easier. You’ll feel relieved when you make the switch, and enjoy your home’s enhanced curb appeal every time you pull in the driveway! Feldco offers homeowners in the Quad Cities high quality seamless gutters. With their ease of maintenance, durability and structural integrity, they’re the perfect option for any style home – get a free quote now.